If you are lucky, you will have acquired your cyclemotor already fixed to a bicycle. I have never been that fortunate, and the cyclemotors that have passed through my hands have all been acquired as an assortment of rusty, oily parts loosely bound together with frayed control cables. The initial concern on first sorting through the bits is how to fix the broken and worn out parts, and more usually, how on earth are replacements to be found for all the missing bits? However, when all these obstacles have been successfully surmounted, your problems are not over. You will need a bicycle to fit your cyclemotor to. No problem, you might think; cyclemotors were designed to be capable of being fitted to any bicycle, right? Well, actually, no. There are a number of bicycle design features that make some types better suited to one sort of cyclemotor than another. If an ill matched pairing of cyclemotor and bicycle is attempted, you will put yourself to a lot of trouble and expense to make the two fit. These features include frame type and size, type of brakes and wheels, together with other features such as number of spokes, chain-case and tyre size. Assuming that you are intending to fit your cyclemotor to a period machine and, like myself, you are as much an enthusiast for old bicycles as for cyclemotors, then you may be reluctant to make extensive and sometimes irreversible modifications to a perfectly sound 50 year old bicycle. 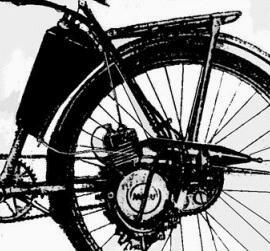 I do not believe that the appropriate matching of bicycle and cyclemotor has previously been covered in Buzzing, so I offer the following advice, gleaned from the restoration of many cyclemotors of all types. I have only commented on those cyclemotors that I have had direct experience of, but perhaps owners of other machines may wish to share their experiences. Furthermore, I have taken that it is a period bicycle that is to be motorised. You will encounter all sorts of additional difficulties brought about by unusual frame geometry or tube size if you try to pair a fifty-year-old cyclemotor with, for example, a modern mountain bike. The most significant restraint with such machines is the wheel size. The two most common examples given above came fitted with 26 inch Westwood rims, and a change to some other size to suit, say a 28 inch wheeled bicycle would not only be unoriginal, but would leave the machine hopelessly overgeared. So look for a 26 inch wheeled bicycle. Not too much of a problem as most bicycles use this size, but consideration is also required to the type of brakes fitted to the bicycle. Both Cyclemaster (other than the early models) and Winged Wheel have hub brakes fitted and these are much preferable to retention of the cycle's rim brake. The rim of such machines tends to become quickly contaminated with oil from the exhaust, rendering the stirrup brake that the original rims require, virtually useless. Other parts of the candidate bicycle that will require discarding are the rear wheel and three speed (of course) and the chain case. While it is possible, with some slight modification, to retain the chain case, this is only at the expense of making rear wheel removal and replacement even more awkward than it already is with such machines. Such machines are all of continental origin. 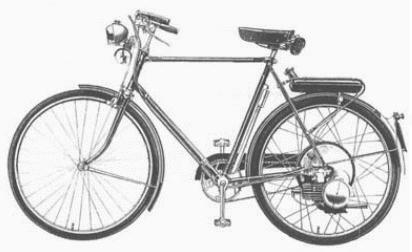 I don't believe any cyclemotors of this type were normally available in the UK, so of course you will need to consider acquisition of a suitable continental bicycle. 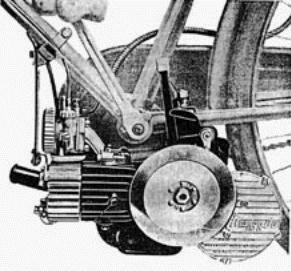 I have experience of only one cyclemotor of this type, and that, the Dutch Sinamec comes fitted in a 28 inch front wheel. 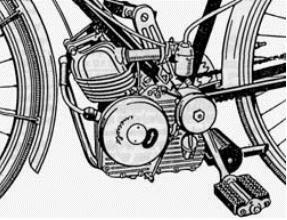 Furthermore, the method of mounting the petrol tank means that no front brake can be fitted. This somewhat limits your choice of suitable machine, and my own Sinamec is fitted in an anonymous Dutch bicycle with both coaster brake and stirrup brake fitted to the rear wheel. There are more different makes of cyclemotor of this type than of any other, as it offers an easy, cheap, and under most circumstances, effective form of transmission. There are no technical restrictions on the size of the bicycle wheel, as the wheel is effectively an idler between cyclemotor roller and the ground, and its size has no effect on the overall gearing. Such cyclemotors can therefore be readily mounted on a wide range of bicycles. However, there are practical considerations to be taken into account. Some roller drives can be very harsh on the bicycle's tyres, so in order to avoid needless trouble and expense, I would advise against fitting to a bicycle with unusual, or hard to get tyre sizes. Stick to the common and cheap 26×11/4 or 26×13/8 sizes. 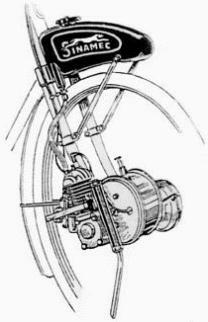 Front drive machines, particularly those of continental origin, may make it difficult for the original bicycle brake mechanism to be retained, as the engine occupies the space normally taken up by calliper or stirrup brakes. 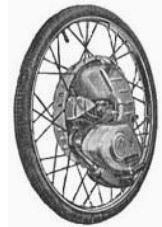 You will therefore either require two rear brakes, or preferably, the fitting of a cable operated front drum brake. You will also need to cut the front mudguard forward of the fork crown. Do you really want to modify your bicycle irreversibly in this manner? Incidentally, nothing to do with the bicycle, but you will also need to wear old boots when riding your front drive cycle motor, as they tend to cover your feet in oil chucked out of the forward mounted exhaust pipe. Rear drive machines will similarly require a section to be cut from the rear mudguard, although there are generally no restrictions on the type of bicycle brakes. A point worth highlighting is the alternative arrangements required by some cyclemotors to suit different cycle frame sizes and design. 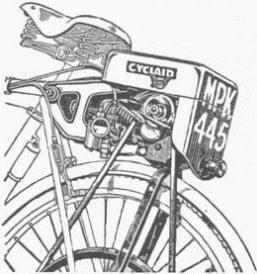 Both Power Pak and Teagle offered optional fittings to suit different frame sizes, and although not a roller drive, Cyclaid similarly offered alternative engine plates to fit drop frame bicycles. What type of fitting has your cyclemotor? Don't make life hard for yourself by mounting it on a bicycle that needs the optional fittings you don't have. The bottom bracket is the ideal place to fit a cyclemotor, in my view. It produces the most stable and even running machine. However, care needs to be taken in the selection of a suitable bicycle, particularly as regards the bottom bracket width and height. 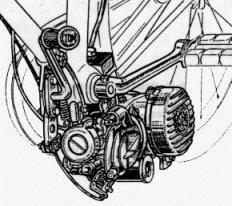 Cyclemotors hung beneath the bottom bracket must be both narrow, so they do not obstruct the normal use of the pedals, and high enough, so they do not hit the ground, particularly when wheeling the machine over a kerb. Therefore, select a bicycle with a high and wide bottom bracket. This may preclude some earlier bicycles and those with small wheels. I would further advise caution when considering the fitting of a sprung front fork, such as a Webb or Alpha, as the bottom bracket ground clearance will be further reduced when the fork is fully compressed. Serious damage can be caused to your cyclemotor if it hits the ground, even at modest speed. I believe it to be no coincidence that the majority of bottom bracket cyclemotors I have acquired have been minus their original exhaust systems-the bit that usually hits the ground first! As regards the available width between the bicycle pedal cranks, different cyclemotor manufacturers have adopted different strategies to deal with this problem. Some have designed a very narrow engine. In the case of the Mosquito, this was achieved by cleverly incorporating the normally bulky magneto into the roller itself. 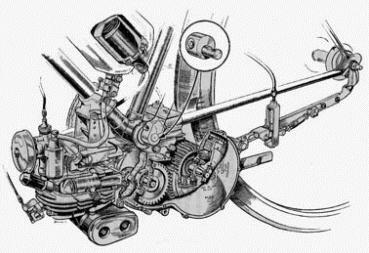 In the case of the Lohmann, it was equally cleverly achieved by a compression ignition motor that has no need of a magneto. "In case the tread cranks will rub the motor, experience showed that these can easily be bent off"
The location of the motor prevents the use of most rod operated stirrup brakes. Best go for a bicycle with cable operated calliper brakes. You will most probably have to remove the chain case. Although period advertisements frequently show the chain case in place, I have never been able to achieve this without cutting the chain case. If the bicycle is fitted with tyre inflator clips on the down tube, then these will probably foul the cyclemotor mountings and will have to be cut off. 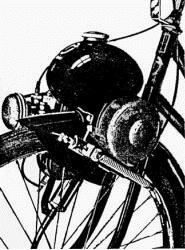 Some types of ladies' frames, particularly those with curved or linked down tubes, do not lend themselves easily to cyclemotors with down tube mounted petrol tanks; for example, Vincent Firefly and some Itom Tourist models. 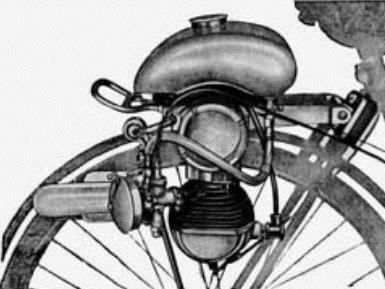 Such cyclemotors may drive directly by the bicycle's own chain, e.g: the Ducati Cucciolo, or by a fitting clipped to the spokes of one of the bicycle wheels, e.g: Cyclaid (belt drive), Bantamoto (gear drive) or MAW (chain drive). There are few types of direct drive cyclemotors which use the bicycle's own chain transmission. The only such type available in the UK was the Ducati Cucciolo, and the selection of an appropriate bicycle to suit this machine could take up the whole of this article. The main factor, which I would stress, is STRENGTH. The Ducati will transform your bicycle into a light motor cycle capable of sustaining speeds well in excess of twice those that you might fleetingly have reached when pedal powered. The frame, spokes, rims and tyres will all have a short life if the machine is ridden far, or fast, particularly if like me, the rider is carrying a bit too much weight. Chose a heavy duty frame, and consider fitting a suspension fork and a well-sprung saddle to reduce the dynamic loads on the cycle parts. The Ducati fits well beneath the bicycle bottom bracket and I have not experienced ground clearance problems with my own machine, even though an Alpha sprung fork is fitted. My machine is fitted with ordinary bicycle calliper brakes, and these are not really adequate. Later versions of the Cucciolo were sold in this country by Britax, and came ready fitted in a heavy-duty frame with drum brakes. It would be wise to fit such more powerful brakes to a bicycle that is a prospective host to a Ducati. The overall gearing of direct drive cyclemotors is effected by the size of the driven wheel, and the clip on fitting will be sized for a particular bicycle wheel size. If you chose the wrong size wheel for your cyclemotor, you will end up with either an under geared machine, i.e: no power, or equally as bad, an over geared machine, i.e: slow and noisy. If you have no information to guide you, it would be a fair guess to assume that a 26 inch wheel would be suitable, but you may be caught out by continental cyclemotors, as 28 inch wheeled bicycles are more common over the Channel. If you cannot find out for sure what wheel size your fitting is suited to, then you will need to do some maths to work it out Consider the gearing of other cyclemotors. For example, most roller drive cyclemotors have a roller diameter of about 50mm, i.e: for one engine revolution the bicycle is propelled forward by approximately 150mm(or 6 inches if you prefer period units). Using this basic fact of life for small cyclemotors, check how far one engine revolution moves your chosen machine for a range of credible wheel sizes, and pick the most probable size. You will now need to consider how many spokes your wheel has. The clip on drive fitting will be drilled to suit 36 or 40 spoke wheels, and to change from one type to the other involves drilling a completely new set of holes in your nice, original fitting. This may not be possible on the usually small diameter sprockets found on chain driven machines. Best therefore to fit to a wheel that has the correct number of spokes-but how will you know? If, like most machines of this type, it is continental in origin, then it will probably be drilled for 36 spokes. The Cyclaid, which of course is British, will have its drive pulley drilled for 40 spokes (if you are lucky enough to have the rare original pulley). If the number of holes in your cyclemotor's drive fitting is divisible by nine, choose a 36-spoke wheel; if it is divisible by 10, go for a 40-spoke wheel. Finally, some of the clip on drive fittings may have too small an inner diameter to permit the use of a large diameter hub. My own East German MAW cyclemotor drives by a chain sprocket that will not fit a three-speed hub. You may therefore be forced, as I was, to fit a single speed rear hub. So there you have it. A practical guide to the selection of a bicycle for your cyclemotor. However, life is seldom kind enough to allow a free choice in picking precisely the correct bicycle you need for that special cyclemotor, and it is more likely that you will have to make do with what you can find. In which case, this guide will give you advance warning of the problems you may have lying in wait for you when you begin to bolt the two together. Doing just that is how I worked all this lot out! Best of luck to you.